As bargaining at AT&T Mobility in District 3, AT&T Midwest, and Legacy AT&T gets underway in early 2018, AT&T workers held informational picketing at numerous locations across the country to show AT&T that workers are united in a common goal of protecting jobs and negotiating fair contracts. 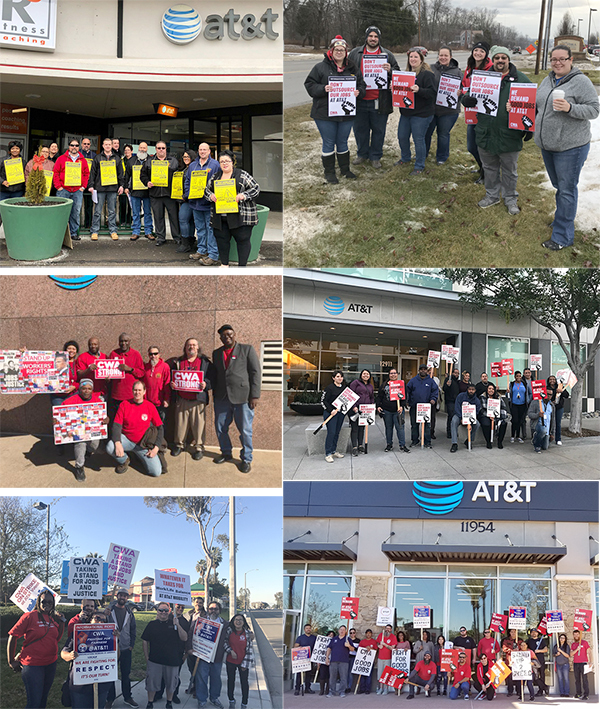 These nationwide actions shine a spotlight on AT&T's continued offshoring and outsourcing of union jobs and the threat it poses to workers and communities. Workers called out AT&T for laying off scores of workers even as outsourcing continues. In 2016, AT&T brought in $163 billion in revenue and made $13 billion in profit. This success was built on the hard work of CWA members at AT&T. But instead of sharing that success, AT&T management has used those profits to pay themselves and funneled billions to investors. AT&T has paid out $31 billion in dividends and $2.4 billion in share buybacks since 2014. AT&T CEO Randall Stephenson was paid $28.4 million in 2016 and raked in $100 million over the past four years. AT&T investors and management are now going to benefit even more from the Republican corporate tax cuts. AT&T has said they will pay workers a $1,000 bonus, a far cry from the $4,000 promised by President Trump. On top of all this, AT&T announced layoffs of techs and customer service reps, while continuing to outsource work to low-wage vendors both in the U.S. and offshore. CWA is taking this on, filing lawsuits and grievances, and making sure those who are laid off get every penny of pay, severance, and other benefits to which they are entitled. Members participating in the actions are telling AT&T that now that the company's gotten the corporate tax break it wanted, AT&T must follow through on promises made to invest in good union jobs here in the United States. AT&T is massively profitable thanks to the hard work of CWA members, and members will be fighting for a fair contract that recognizes our hard work. Clockwise from top left: Local 1298, Hamden, CT; Local 4320, Boardman, OR; Local 9400, Cerritos, CA; Locals 9509 and 9511, San Diego, CA; Local 9510, Newport Beach, CA; Local 6150, Dallas, TX. 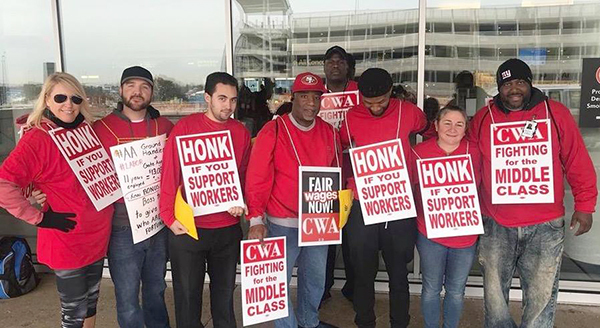 In 2013, CWA District 6 took a grievance all the way to arbitration where we got a ruling that two dozen CWA-represented AT&T customer service representatives in St. Louis were entitled to higher-classification differential pay under their contract for performing duties of a higher-paid job for a lengthy period of time as a temporary assignment. When CWA attempted to calculate the back-pay with the company, AT&T offered a ridiculously low-ball figure and then went to federal court to attempt to avoid having to pay. The court ruled in CWA's favor, and AT&T was forced to participate in a round of remedy hearings before the arbitrator. Now, four years after the initial arbitration award, 22 workers have finally received a total of more than $228,000 – more than four times what AT&T initially offered. Fifteen received amounts in the $11,000 to $14,500 range. "This is a big victory not only for the workers finally receiving the back-pay they deserved, but it's also a win for all workers at AT&T," said CWA District 6 Vice President Claude Cummings. "The company tried every avenue in the court system to try to skirt their legal duty to negotiate job duty changes with the Union, and we won at every level of their appeal. This win sends a strong message to AT&T that we will fight them for what is right no matter how long it takes." Piedmont Airlines passenger service agents – members of CWA Local 3645 in Charlotte, NC, and Fort Walton Beach, FL – held informational picketing to make their voices heard for a fair contract and to support the bargaining team as they go back to the table this week. Piedmont employees are determined to negotiate a fair return on their work. Despite extensive job responsibilities and long hours, Piedmont agents start at less than $10 an hour. Piedmont is a wholly-owned subsidiary of American Airlines, which made $6.8 billion in profits last year. 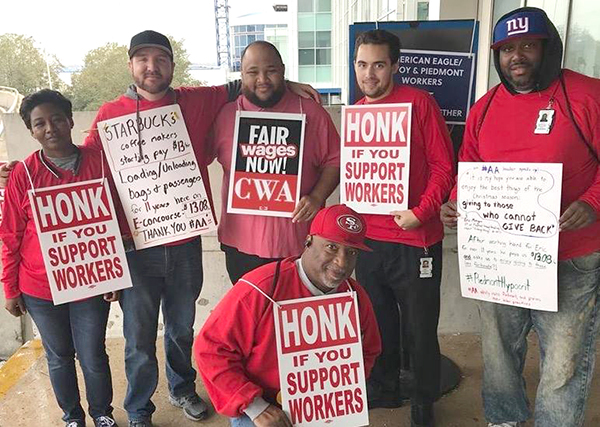 Piedmont Airlines passenger service agents from CWA Local 3645 in Charlotte, NC, and Fort Walton Beach, FL, held informational picketing to make their voices heard for a fair contract. "Today we made history," they wrote in a letter to their co-workers. "For the first time since the Los Angeles Times printed its inaugural edition in 1881, our journalists have voted to form a union. We've long been a proud voice for our readers. Finally, we can be a proud voice for ourselves. Anyone familiar with the history of The Times — and of Los Angeles itself — knows the significance of what we've just accomplished." 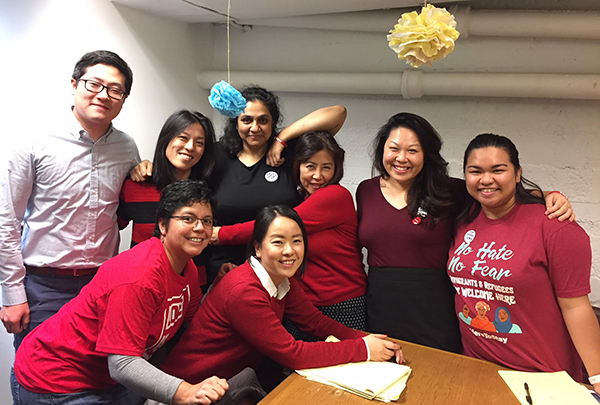 Attorneys and support staff at Asian Pacific Islander Legal Outreach voted to join CWA Local 9415. API Legal Outreach provides legal and support services in the San Francisco Bay Area. Following outcry from activists and lawmakers, FCC Chairman Ajai Pai dropped his radical proposal to lower the speed required for an internet connection to be considered broadband and conceded that cell phones are no substitute for wireline broadband. Pai's proposal would have meant that people who live in areas where companies aren't providing true high-speed fiber or cable connections would have been considered by the FCC to be "adequately served" as long as they have cell phones. This change would have resulted in less investment in job-creating broadband networks. To bring attention to Pai's proposal, CWA members and allies participated in the #MobileOnly Challenge, pledging to spend one day using only a mobile device, disconnected from wi-fi, to access the Internet and tell Pai about their experience. The bad news is that Pai's proposed annual report on the progress of broadband deployment, which is mandated by the Communications Act, concludes that broadband is being deployed in a "reasonable and timely fashion." Tell that to the tens of millions of people still stuck without broadband access. FCC Commissioners will vote on the annual report – and should object to the outrageous conclusion that broadband is being deployed in a reasonable and timely manner. "More than 34 million people still lack access to broadband at the Commission’s 25/3 Mbps speed definition," CWA wrote in comments to FCC. "There are still too many school children who must sit on the library steps or go to McDonald’s for wi-fi access to do their homework." Following a tragic December 23 fire at a call center in Davao City, Philippines, that claimed the lives of 38 call center workers, CWA President Chris Shelton has sent letters to the CEOs of AT&T, T-Mobile, and Verizon seeking to ensure that workers in these companies' offshored call centers in the Philippines and beyond are "employed in a safe and healthful manner." While the investigation into the cause and liability of the Davao City fire is ongoing, the CWA letters note that "reports indicate that faulty sprinkler and alarm systems, along with dangerously designed fire escapes – including potentially serious violations of fire codes – were major contributors to this terrible loss of life." In light of the large numbers of call center jobs that AT&T, Verizon, and T-Mobile have offshored from the U.S. to the Philippines, the CWA letters urge these companies "to require extensive safety inspections in all of the offshore call centers that handle…calls, and to ensure that safety equipment and procedures meet international standards, even if above and beyond domestic laws. No worker, anywhere, should be employed in a center that does not properly provide for the protection of their life." The CWA letters also note "that the lax labor and safety regulations in the Philippines and other offshore call center destinations are among the reasons companies…choose to offshore their work," while condemning "offshoring as a means to avoid corporate responsibility for the safety of workers." CWA, which believes that the offshoring trend has harmed American communities, workers, and consumers, also urges the companies to "take all steps necessary to bring work back to the U.S." CWA is a strong supporter of federal call center legislation that would add more accountability and transparency to offshoring and would make U.S. companies that offshore their call center jobs from the U.S. ineligible for certain federal grants and taxpayer-funded loans. Read the full letters CWA sent to AT&T CEO Stephenson, Verizon CEO McAdam, and T-Mobile CEO Legere. 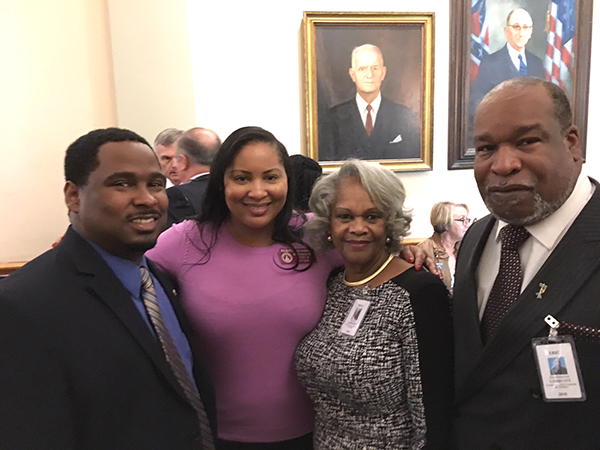 A CWA delegation went to the Georgia State Capitol in Atlanta to lobby for state legislation to protect call center jobs, HB 495, as part of CWA Georgia Political Council's 2018 Georgia Legislative Conference. Members of CWA Local 3204 Tony Barlow, Rita Scott, Eric Richardson, with Georgia State Representative Renitta Shannon (second from left).